MTR (methionine synthase) and MTRR (methionine synthase reductase) are two genes involved in the conversion of homocysteine to methionine, and a couple of fairly common gene variants cause the genes to work differently. Why is this something to care about? Methionine is an essential amino acid, used in the production of proteins; it is literally the starting amino acid in the code for every protein your body makes. 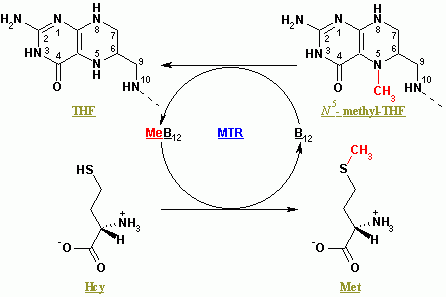 MTR (methionine synthase) and MTRR (methionine synthase reductase) code for enzymes work together in the methylation cycle. MTR works in the final step to regenerate homocysteine into methionine using methylcobalamin (methyl-B12), and MTRR regenerates the methylcobalamin for MTR to use. [ref] Both are a vital part of the methylation cycle. Goldilocks comes to mind here… You want to have the ‘just right’ amount of methylation reactions going on, and your body works to keep this all in balance. For example, you need enough folate and methylcobalamin for the methionine synthase reaction to occur. Methylfolate is the source of the methyl group that methionine synthase uses for converting homocysteine to methionine. Not enough B12 or methylfolate? 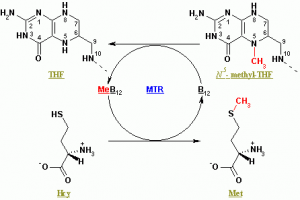 MTR won’t convert as much homocysteine to methionine, leading to a buildup of homocysteine and a limit on methionine. The other side of the picture, though, is that there may be times that limiting methionine is helpful, such as in fighting the proliferation of cancer cells. Methotrexate, a chemotherapy drug, works by inhibiting the production of methylfolate, thus limiting methionine and DNA synthesis for cell growth. MTR uses methylcobalamin (methyl-B12) and zinc in the reaction of converting homocysteine to methionine. Thus, an increase in enzyme activity can keep homocysteine levels lower (generally a good thing), but only if there is plentiful methylcobalamin. So people with this variant should ensure that they are getting methyl-B12 and zinc, either through diet or supplements. Quite a few recent studies found no association between the MTR polymorphism and cancer risks, so diet and lifestyle choices play a role. A small Iranian study found that the MTR A2756G variant was linked to a slightly higher risk of autism. Methionine synthase reductase has several fairly common variants that affect the production of the MTRR enzyme which regenerates vitamin B12 (methylcobalamin) for use by MTR and other enzymes. The variant rs1801394 is also known as A66G, and it decreases this enzyme’s efficiency. It is a fairly common variant which is carried by about half the population. It seems that combinations of MTRR polymorphisms with MTHFR or other methylation cycle issues may be more of a concern than just carrying the single MTRR variant. Folate and B12: A healthy diet high in folate and B12 seems to be essential for overcoming any deficits created by these two polymorphisms. Foods high in folate include leafy greens, chicken liver, beef liver, asparagus, broccoli, and legumes. Vitamin B12 is only found in animal products with liver being an excellent source. If you have the MTRR polymorphisms and are considering supplementing with B-12, you should first read the article on COMT. There are four different types of B-12, and some work better than others, depending on your COMT variants. If you are looking for an adenosylcobalamin and hydroxocobalamin sublingual supplement, I like the Seeking Health brand combo Hydrox-Adeno. There are many good sources of methylcobalamin, and you may be able to find it at your local health food store as well. Thanks for reading and commenting on this blog post. Yes, it looks like you have several genetic variants that are linked to a higher risk for increased homocysteine levels. But diet, lifestyle, age, and other genes also come into play for histamine levels. That is why you do the blood test :-) I also carry several of the risk factors for high homocysteine, but have normal homocysteine levels. There are also other SNPs that up-regulate the processing of homocysteine, such as CBS. I have several paradoxical SNPs like that, which make it really difficult to address deficiencies. While MTHFR mutations generally respond well to methyl groups, I don’t tolerate them well at all due to CBS and possibly other SNPs. It is all very complex! So, in short, the low homocysteine may be due to other SNPs, which may create their own issues! And the low homocysteine may not necessarily be a good thing. Definitely check your CBS. Going with what Stacy said, low homocysteine (especially in <5 range) is a very good indicator of CBS activity and would definitely change the way you have to approach supplementation/detoxification. Look at heartfixer.com and http://resqua.com/702188759/what-does-a-cbs-gene-mutation-mean both of these will explain what you're up against if you do indeed needfind that you have CBS – NOS – SUOX SNPs good luck! I uploaded my 23& Me to a site called xcode. I cant understand their report. Is there anyone who interprets these reports for individuals? Interesting. I actually thought that their paid reports were supposed to be something that was easy to understand (thus the cost!). Hopefully, someone can chime in here with a practitioner who specializes in interpreting the xcode report.